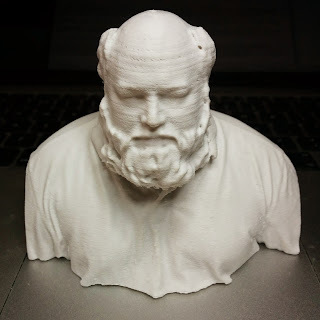 This is the first in a series of posts relating to my experience of getting into 3D Printing. 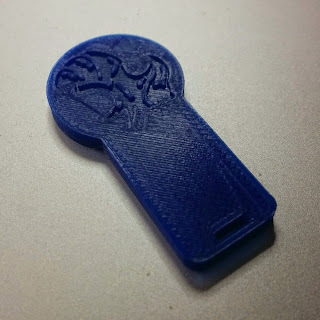 A long story short, I was roped into helping out a friend of mine with a 3D printing issue. I had a budget and a clear goal so armed with a pretty technical brain - on to the research. The software is really easy to use. Only a few parameters to tweak so not a lot you can really break. The rafts used to stick the extruded plastic to the bed were awesome. Once you got the print off the bed, the object just peeled off the raft. 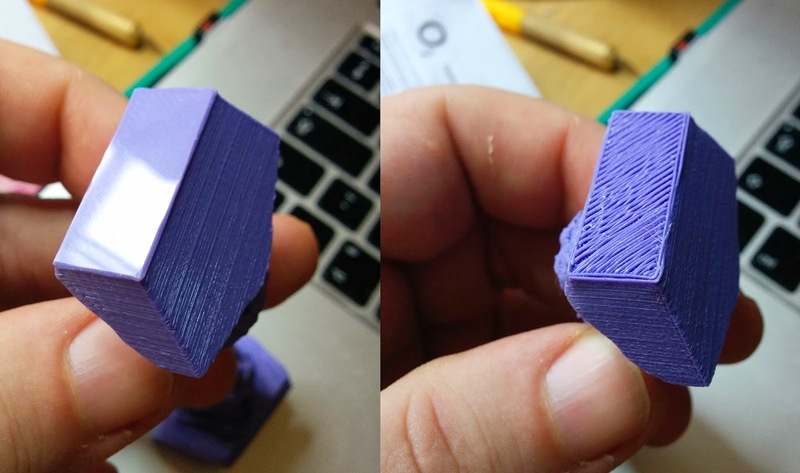 Supports used so that overhangs didn't print in mid-air were also pretty awesome, and broke away pretty cleanly. Overall, this was a pretty good consumer product (based on a pretty small test sample). The cost was pretty close to the top end of my budget. (But is the extra worth the almost consumer ready status). The plastic bed meant that prints were pretty tricky to peel off. Looking at the other printers in the range and the software that you used, it was clear that the 5th Generation Replicator was my back stop option. It was WiFi ready so I could check it while out and about, it had a webcam and could produce timelapse video all the while being lit nicely and having a few test items built into the printer and a great interface. I wasn't just going to plump with the Makerbot. I had a duty of care for my budget, so I really had to make sure this was the right option despite all the really cool stuff. I researched about a dozen printers and ended up with the 2 others on my short list. Rank outsider was the Felix 3.0, being really cheap with dual extruders and upgradeable it seemed like a really good option. The downside was the software was really clunky and it was noisy. My eventual makerbot rival soon became the Ultimaker 2. Sure it was a single extruder, but it was upgradable, it was also pretty quiet, fast and accurate. The software was a generic product called Cura it is an open source product like the printer itself and has profiles for many printers. This does mean there are a lot of options you can play with and stuff up. Interestingly, the first series of Ultimaker were made of wood. Price was good compared with the Makerbot. Not as 'consumer' but I was technical enough to handle tweaking a few parameters. The resolution went to 20 micron whereas the makerbot only did 100 micron. This turns out to be an irrelevant entry on this list. The webcam and other whizzy stuff of the makerbot didn't really add value. Heated glass bed for better adhesion, and easy removal when cool. An Ultimaker was ordered and arrived quickly... Lets play!!! Out of the box, general impressions were really good for simple objects. It was also clear that rafts you use to stick your print to the bed were absolute pants (**UPDATE: Rafts are now a lot less pants after an update). After a hunt on the interweb it seems a fix is in the works, but 4 months after the update went into the software it's still not released. Supports were also quite bad, but tweaking the parameters it was possible to get these to a satisfactory level. Of the 4 places in the UK I know where to get human help for 3D printing, I went to Creat3d in Caversham near reading. A chap called Simon was really helpful in explaining lots of points over several visits and emails, and even helped by printing out a couple of my pieces for comparison. If you're based daaaan sarf, this is probably the place to pop in and chat to a team of helpful and knowledgeable folk who have a great Labrador as well. After several tests, trials, tribulations and much hair pulling, there are several other quirks that bug me. Small objects do not print well unless they are REALLY simple. Anything with a round underside takes a LOT of tweaking to get to an acceptable point and for smaller objects - no hope what so ever, not even with rafts or supports. Without rafts, you have to be really good with levelling the print bed. I seem to have either way to close, or way to far away with nothing in the middle. Again, more tweaks in the software get this under control. More to do with the software it seems, but sometimes on smaller models you can get some over extrusion which is not desirable. The 20 micron print resolution applies to the layer height only, this means a print takes FOREVER to print and you don't get significantly better prints. 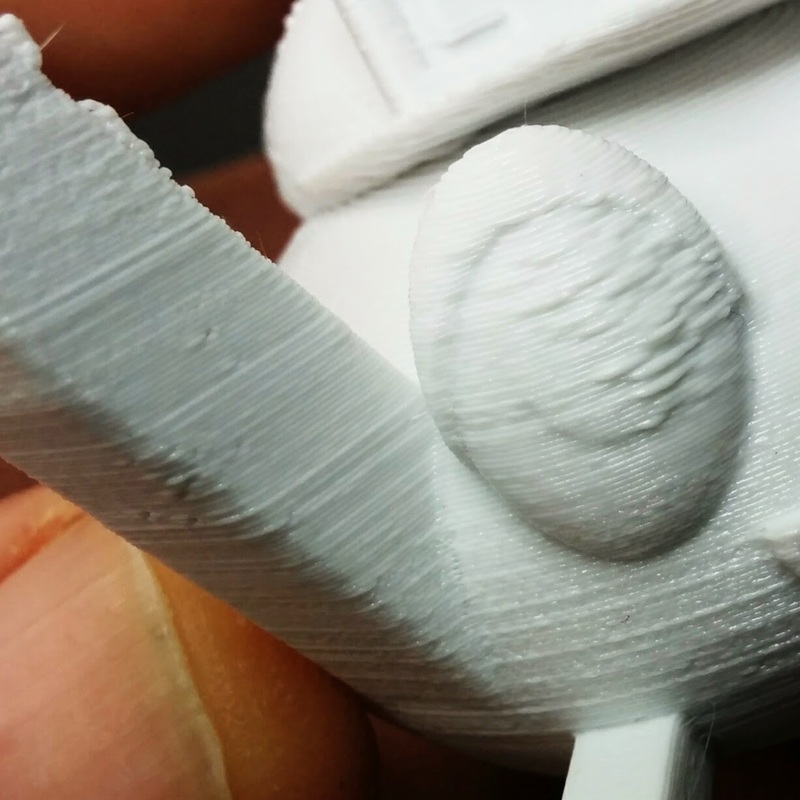 Regardless of the print resolution, you're stuck with the size of the nozzle. This means the thinnest strand you can get is 0.4mm. This is not an Ultimaker issue, but 3D printing of this type in general. The inbuilt lights flicker slightly as it prints. Not a big issue but you do notice it out the corner of your eye if you're watching telly. Odd lines appear when you use a larger layer height and the layers differ a lot. You can address this a bit by using a thinner layer height, but the downside is the print time will double, also making the print bigger will help this, but that might not be an option. 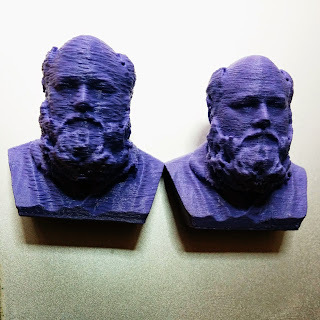 The print on the left was a 0.2mm layer, the one on the right was 0.1mm. It's not all doom and gloom people!! At least my Bat-ataches and pound coin trolley tags are coming out awesomely!!! So the major hurdle over, the Ultimaker comes with a reel of PLA filament and so playing with that is fun, but what else is there. Well, generally there are 2 types of plastic. ABS is a general purpose plastic made from petroleum products. It's pretty hard wearing and produces pretty good prints. ABS requires quite a lot of heat so if you want to use any other type of plastic you'll need to make sure you clean your extruder really well. PLA is a biodegradable plastic not made from any petroleum products. It produces good quality prints but can be brittle. PLA is becoming the norm for printing and it is being improved on and provides a good basis for other types of plastic, for example wood fill and sandstone. Woodfill is basically PLA with very fine particles of wood added while sandstone is PLA with chalk added. There is also a new type of PLA enhanced with PHA... I know, a lot of acronyms. 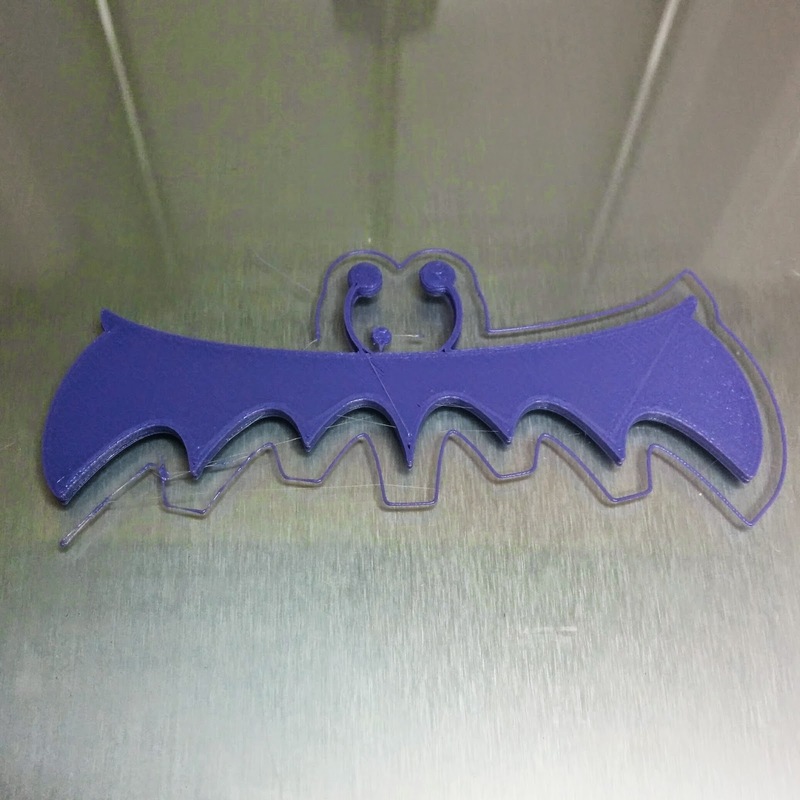 Anyhow PLA/PHA is less brittle than regular PLA and gives some better print properties like ABS. Other specialist materials are being produced all the time, for example Ninjaflex which is very flexible and Innosolve which allows you to make items that cannot be printed any other way, for example marbles in a bottle, or enclosed joints and bearings. You need a dual extruder for this, and it basically fills in the gaps and you then dissolve it out of your print at the end. Wax is also being used to make things for investment casting, but this is rather new and will take a while to get to a good place. 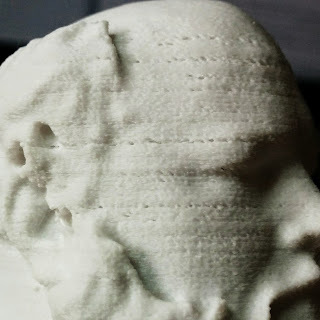 The printers above are from a class of printing called Fused Filament Fabrication (FFF). This technology is an entry level printing technology and while the price is still high it is the cheapest option. The next step up is Stereolithography (SLA) and prices start at about twice that of a good FFF printer. This process uses a laser to trace your each layer of your model in a vat of resin. This method can be used to get extremely fine resolution models but supports are still required and can be tricky to remove. Print volumes are also really small for a reasonable cost. Commercial printers can be very large but cost many thousands of pounds. At the top end of the spectrum you have Selective Laser Sintering (SLS). The process is similar to the SLA process but instead of liquid resin, a powdered material is used. The downside with this is that resolution is not a great as SLA (but can be better than FFF) but the significant upside is that no supports are required as the powder holds the model while it is printed. The upsides with the laser printing are a much better surface quality and resolution, the downside is that you need to build your model so it can let excess material out of the middle or it will be solid, heavy and expensive. SLA and SLS technology is pretty much out of the realms of the average hobbyist but Shapeways is a web company that will print your model for you. Shipping prices and lead time are crippling though if you're looking at using them for prototyping. The next post will be about the model development and the issues I faced there. Click here to read it.